Deadpool: amusing, not really belly-laugh material. 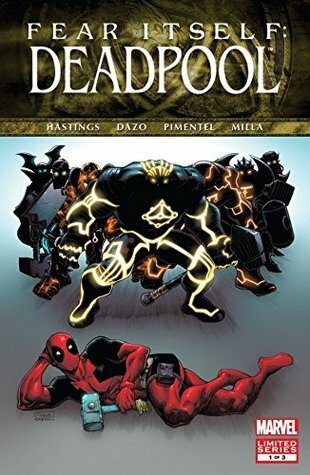 Good art (I happen to like the thick outlines stuff), but story was mostly throwaway - both as a Fear Itself tie-in and as a Deadpool tale.Fearsome Four: WTF? All this repetitive talk of "nexus of all realities" and the endless, impossible-to-follow fist-smashing, makes my head hurt and my patience thin out like an aging cop's hairline. The constant tonal shifts from jarring artist changes doesn't help either.Worst of all though is to throw She-Hulk in with this lot of D-list throwbacks. I have a lot more respect for Jennifer as a serious character than as a punchline or straight man for lame attempts at Howard the Duck "humour".When the climax threatens to break, the cliches, lumbering dialogue and arrested-time-while-the-hero-monologues-like-a-moron-instead-of-acting all mount up on a posse of crap. What could have been a mildly interesting conclusion just falls apart into terrible fragments of better storytellers.2 for Deadpool, 1 for 'fearsome four'. Not awful. Just missing some of the usual charm. As in story could have been a lot better. This is what happens when two, mostly unconnected stories, end up in one collection. The Deadpool section was what one would expect from a Deadpool tale. The gags were decent, the premise ridiculous, and the villains even more so. All that being said, it was good. The Fearsome Four section was really bad. Multiple artists of varying degrees of talent, all wrong for this story. This story being ridiculous in a bad way. It took a good idea (Man-Thing going nuts during Fear Itself) and it went South quickly. Overall, unless you are a Deadpool completist, this is skippable. I liked the Deadpool part of this story but wasn't too fond of the Howard the Duck part. It was boring and a bit slow moving, plus I've never been a Howard the Duck fan. However, the Deadpool part of the story was hilarious and well done. This is my first experience reading Deadpool and it was a little too silly for me. I did like how they linked the hammers idea in though and I'm not giving up on Deadpool yet. I did like the art a LOT - Bong Dazo rocks! The whole Fear Itself storyline is kind of sketchy but Deadpool is always a win. Someone seriously needs to cosplay this Deadpool. Note that the rating is just for the Deadpool storyline! Haven't read the other. Christopher Hastings - writerBong Dazo - artist3/5Crazy Deadpool shenanigans with werewolves and hilarious c-listers. Meh. The Merc with a Mouth is about too clever by half. And Howard the Duck? Really?